See the winners of our 2019 Choice Awards! Click Here! Please confirm details with organizers BEFORE setting out. Due to changes in schedules and exhibits at locations, we cannot guarantee the accuracy of the event information. Family Storytime is a fun and engaging program for the whole family! Children will listen to stories learn new songs rhymes and finger plays participate in flannel activities watch puppet shows and more! 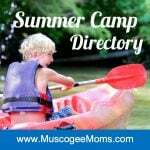 Muscogee Moms® (and dads!) is Your Guide to Family Fun. We are here to help you find fun events and activities for your family to do around the Columbus, Georgia Metropolitan Area.